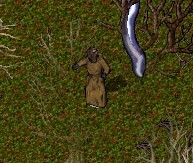 Not since his Shadowquest, over five cycles ago, had he experienced one of the visions of his past or the predictions of the future that he frequently had as a gruntee. He wasn't sure if it was the routineness of grunt life, or if it was just a wearing off of the mojo he believed caused those dreams. Smo never thought the Wargod made him have the dreams, since the Wargod never mentioned them. Instead, he thought that the dreams were a relic of his past, the last bits of mystical power left inside him after the freak accident which created Smo'dis in the first place. For a couple of cycles, he wondered why the dreams had left him. Until the moon that they returned. Smo had just laid down for the night after the trip to the Undead Lords' tower. There was some strange mojo at work there, the likes of which Smo could not recall experiencing before. But he felt unusually tired afterwards, and went to sleep before the next trip. The first thing he noticed was that he was in some sort of hut. No hut like the orcs had, though. It was more spacious and had a large porch with a lamp post on it. He picked up a shield lying around and looked into it, and saw a human staring back at him. The human was covered in grayish-white hair; he was stooped over; and the signs of age were evident in his old, tired face. Smo was startled for a moment, and dropped the shield, but this feeling left him when he realized it was only a figure from his past. He picked up the shield and looked into it again, unwittingly having flipped it over. He saw himself as a gruntee: young, perky, and full of excitement. A movement caught his eye. He thought he saw some humans running past outside. But he turned back to the shield and looked again. It was Smo again, but the Smo of the present. Though far from old, age was definitely catching up to him. The eyes seemed more weary, as if they've been working harder to provide the body with visual information. The face showed more wear, brought on from many moons of clomping. He was no longer as fast as he used to be, and even his mighty luskr strength was beginning to ebb away. He heard noises outside. He opened the door, stashing the shield in his pack. A gang of four humans were chasing after another human. The human being chased looked awfully familiar. As Smo was deciding what to do, he saw another human attack the four with powerful magic. Though his magic was strong, Smo realized that four against one, even though the four looked relatively weak, would be deadly for the mage. He felt he had to intervene somehow, but he had no bandages. He had to heal the human. . .
Smo watched in shock as he stretched a bony hand, half concealed by a blue robe, and pointed at the outnumbered human. A shimmer of light later and he was revitalized. Smo realized that this was his human form from long ago. He could feel the magic inside of him. It was extraordinary! He had never felt so powerful in his life, even at his prime as a luskr. He didn't have much time to enjoy it, though. The humans had noticed him when he healed his friend, and had turned their attention on him. And something snapped. He took off on his horse (which felt surprisingly natural to him) and launched himself into the fray. Magic flew everywhere, and the attacking humans dropped like flies. When the magic cleared the air, both Smo and the other mage were red-toned from a combination of their enemies' blood and their own body heat worked up through battle. However shocked Smo was at his sudden change of temper from peaceful and recuperative to violent and bloodthirsty, he was even more shocked when he compared it to one of the last things that happened in the waking moon. A gruntee had fallen and had just received flesh from the healer, and Smo, overcome with the desire to help, raced to the runtee and began applying rags. However, the runtee walked away in mid-heal, causing Smo to rip the rag. In a sudden fit of rage which was very unlike the calm Smo'dis, he brought the sharp end of his lusk into the runtee's head, dropping him to the uzg again, while he began screaming about staying still while he was healing. Even Klapdud was shocked by the sudden change in Smo. . .
Smo'dis awoke, trembling. He had ignored dreams of this nature once, and in this case, it could be risky to ignore them again. But this time, it was only one dream. Before, he would have the same dream night after night. After careful deliberation, Smo decided to wait and see if the dream returned before making any hasty decisions. He only hoped his decision wouldn't destroy him. The warning cry echoed throughout the uzg. Within the Surjin hut, Smo'dis's ears perked up. KGB were coming. The fort needed him. He raced towards the fort, and met up with Ur'ug and Zortee on the way. Just before reaching the door, however, they ran into a pack of KGB mages. The spells began to fly. Smo's mojo allergy kicked in, and he crawled towards the safety of the fort walls while coughing and vomiting. He made it just in time to bump into another orc's legs. While struggling to get around, the next spell finished him. Smo was resurrected and jumped back into the fight. Grabbing some rags and ligs which had been dropped for everyone's use, he fended off the attackers with Zortee. But he had not forgotten the mistake which had cost him his life earlier on. Finding his chance to speak alone with the runtee who had blocked him, he screamed, "WHI LAT BLOK DUUR??" The runtee mumbled, "Me wuz defendin. . . "
"YOU IDIOT," Smo screamed, "DON'T YOU KNOW ANYTHING???" The runtee stared at Smo, a look of terror on his face. "Urm. . . wut?" Smo asked. "HUMIE!!" the runtee screamed, pointing at Smo. "HUMIE!!!" "WUT?? I'LL TEACH YOU SOME RESPECT!" and Smo clomped the disrespectful gruntee. "Call me humie, will you. . . " Smo mumbled. Then, as if hearing it for the first time, he repeated himself. " . . . you??" Smo thought this was very strange. He knew some humie blah, from his memories of before he mojoed himself into an orc, but he never spoke it before. Why now? He stroked his chin, comforting himself with the softness of the tiny hairs growing on it. . . hairs?? He raced back into the fort and tore off his helmet. "Lat see hare ub heer?" Smo asked the nearest orc, who happened to be Prool. "PEEJ FUZZ! SMO GRUWIN PEEJ FUZZ!!!" Prool shouted. "EBRIASH LUUK!!" Smo panicked and raced to the Surjin hut. Something weird was definitely happening. But what? What was going on? Then it hit him. The dreams! He'd been having dreams of the humie again. And each dream showed him how he was acting more and more like that humie. Then. . . the dreams did mean something, after all. The magic spell was wearing off, and Smo was turning into a humie again. F'ru showed up in the Surjin hut not long after. "Smo," he asked, "lat ukee?" Smo'dis, sobbing, shook his head. "Me turnin bak intu humie, kuzin. . . me nub wan be humie agin! Wan tu stai ork!" "Me nub gruk. . . mebbi it wuz wen da Wargod fiks'd mi bodee. Mebbi im mezzd it ub! NUW ME GUIN BE HUMIE!!!" Smo started sobbing louder than before. "Kuzin, ib mojo makrd lat uruk ask time, mebbi it wurk agin!" "Y-yub!" Smo stammered. "Dat it! But. . . me alurjik tu mojo. Besidz, me nub gruk huw!" "Dat truu," F'ru responded. "Agh it am tuff tu teech. But wut abowt wen lat bekum humie agin?" "Mite be tuu layt bi den," Smo muttered. "Gah. . . surri kuzin, me nub gruk wut tu tell lat," F'ru answered. "It uki. Mebbi me tink ub sumting latur," Smo responded. And Smo thought, and thought, until he couldn't think any more. Then, exhausted from all the thinking, he fell asleep. And the dreams would change his life forever. Smo'dis looked around. Everything was dark. The rain fell heavily. And his robe was getting soaking wet. The lightning - he felt he could control it! The rain too. . . and the earth, the sky, everything! He felt more powerful than he had ever felt in his life! He saw a strange figure, concealed in shadow, dancing in the woods. "And it all started here, it all started here," the enigma sang. "Come back again, Smo, come again! Heeheehee!!!" Smo'dis woke up. This was the first night in some time that he didn't see the humie in his dreams. Yet he was still wearing a robe, and there was still the pull of magic. Smo was confused. He remembered the strange creature that danced and sang, "It all started here." He thought to himself that maybe that creature would be able to help him. He also knew that if the creature were to be able to help him, that his lusk and olig would be of no use to him. He carefully replaced the weapons in the Surjin hut and set out into the darkness. He had been wandering around in the woods for some time now, and had no clue where he was. But somehow, he felt that he was headed in the right direction. He had no idea why. "WHU DER??" Smo spun around, but there was nobody. Asmodeus - that was the name of the humie he used to be. Before the mojo accident. Who was out there that would know that? "Over here, Asmodeus," the voice came from behind him again, almost laughing. Smo spun around, and found himself face to face with a funny-looking elf. "STOB KALLIN ME DAT UR ME GUIN CLOMP LAT!!" Smo screamed in anger. "You and what lusk? What lusk, what lusk, heeheehee!!" the elf giggled. Smo realized that the elf had a point. He did leave his lusk in the Surjin hut. Sighing, he sat down on a rock. "So you need to learn mojo, do you? Mojo, mojo, but you're allergic to mojo!" the elf sang. "Dat rite. . . ey, lat da ash frum mi dweem!" Smo realized. "Me bet lat been gibbin me deez weerd dweemz!" "Nay nay, that's all your doing, Asmodeus. Asmodeus, Smo'dis, Asmodeus!" the elf laughed. Smo just sat there, silent and depressed, so he continued. "I can teach you mojo, teach you mojo I can! But it will not be pleasant, no no. If you want it so bad, you have to know what will become of you! What will become of you? I can tell you, yes, if you're brave enough to know. Are you brave enough to know, Asmodeus? How about you, Smo'dis?" At this point, Smo was very irritated, but the promise of being able to learn mojo and save himself caught his interest. "Yub yub, juzt teech me mojo!" he said. "Why, it's simple. Simple, I say! You have the ability already. Yes, Asmodeus! It's all in this book! This little book!" The elf handed Smo'dis a spellbook. "Read the words you must, have the weeds you must. When the two combine, mojo will result! But mojos are crazy, you said so yourself. Mojos are crazy, and so shall YOU be! Crazy Smo'dis, crazy! Heeheeheehee!!!" And with those words, the strange elf vanished. "Dum puinti-eerz," Smo'dis mumbled. "Me nub guin gu krayzee. Me nub krayzee ork!" But on the other hand, Smo did frequently say that all mojoka were crazy. What would make him any different? He figured that even if the training did make him mad, it would be better to be crazy than to be a humie, and he decided to begin. He picked some mojo weeds from the ground, and opened the spellbook. He looked at one of the first spells. It looked like a magic lig. "Dis nub luuk su tuff," Smo said. "In Pur Elm!" A strange lig, made completely out of magic, shot out of Smo's hands, U-turned, and hit him in the face! "GAH!" he yelled, just before he began to sneeze and cough. That was unpleasant. But mojoing himself was the only way to remain an orc. Besides, there was nothing else to hit. Smo turned the pages, looking for the spell he needed. He tried each one. Some spells had weird results - one let him see in the darkness, one even created food out of thin air! But most of them affected Smo's allergy. He continued to get worse and worse. Smo was learning mojo, but it was slowly costing him his life. Smo'dis coughed and choked as the mojo surged through him. He was in such pain. Such terrible pain. But he had to continue. There was no other way. He began to cough even worse. Tokshun! He had found the tokshun spell! And he had no cure waters to save him. He quickly thumbed back through the book. He sneezed again, but at least the poison was gone. He sighed in relief, just as he heard voices. Voices! Humans were coming! Smo darted under a nearby bush. Unfortunately, his allergy chose that time to kick in, and he began coughing and sneezing even worse than before. The allergy was out of control. He couldn't stop, couldn't breathe. Everything was dimming. . .
"In. . . Lor. . . " he muttered just before he fell out from under his cover. "What was that?" one of the humans said. They rode through the woods, towards the sounds they heard. And when they got there, they saw an orc, lying unconscious on the ground, clutching a spellbook in his right paw. Smo'dis awoke with a massive headache. He tried to stand up, but his body felt so heavy. He couldn't lift his arms. That was when he noticed the iron chains on them. "Look, the little beast woke up," one of the humans laughed. "Hey, he's a mage! Look at the book! Hey mage, do some magic for us!" another snickered. "Grr. . . dem wan mojo. . . " Smo'dis took a few deep breaths. He could feel the energy coming back to him. "Vas Flam!" A fireball shot out of Smo's hands, scorching one of the humans' faces. He grabbed his face and screamed in pain. The third human, who had been standing silent the whole time, quickly pulled an igg out of its sheath. "You miserable BEAST!" he yelled, and mercilessly slashed at Smo's unprotected face. "Try that again and I'll GUT you!" Smo'dis yelled in pain, as the backlash of mojo combined with the igg wound caused his body to writhe in pain. "Hey, wait. I have an idea," the first human said. 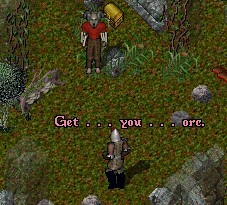 "Hey orc! You like to do mojo so much, why don't you mojo yourself!" Smo realized that if he were to try that trick again, he would be in no position to save himself. Besides, he was mojoing himself before. What difference did it make if he did it now? Another ball of fire scorched Smo'dis's armor. "GAH!" he screamed as he entered his allergic reaction again. "Hey guys, looks like he's allergic to fireballs!" the third one laughed. "Do it again!" "Vas Flam," Smo'dis muttered. Again, he was struck with the fireball. He began coughing and sneezing. But at least he wasn't shivering. The fire felt good. . . warm. But the humies continued to force him to mojo himself. Bit by bit, he was becoming weaker, sicker. They tried to force him to eat, so that he could have the energy to keep torturing himself. But anything he ate, he vomited back up almost immediately. "S-sik. . . " Smo mumbled. He had long since lost the ability to speak in complete sentences. He could barely manage to get words out now. The humans laughed, and said, "Hey orc, turn the page. Try something stronger." Smo felt cold. He lay on the ground, still manacled to the tree where the humans left him. They were all asleep. The lookout had too much to drink, and he passed out. Not long before, he had managed to cast a fourth circle spell. There was a lot of fizzling before it worked, and it may have been better for Smo if it hadn't. The backlash from casting combined with the force of the spell hitting him caused something to snap. He didn't feel sick anymore. It didn't bother him. It was just mojo. The humans seemed to be disappointed that Smo no longer got sick from casting on himself, and went to sleep. However, the humans didn't know that the mojo had a much worse effect on the orc. Smo's rational mind had been destroyed. He knew, instinctively, that he had to escape. He looked at the chains that held him. "Ex Por," he muttered. The chains snapped open. He looked at the humans and felt only hate. He wanted to hurt them. Hurt them like they hurt him. "Vas Flam, Vas Flam, Vas Flam, Vas Flam, Vas Flam," he whispered. The human didn't even wake up as Smo slowly killed him with fireballs. The second was a different story. After the third or so fireball, he screamed. Smo quickly jumped on him, muffled him, and muttered. The human lay still, frozen in death. But his screams woke up the last one. He knew that his mojo was still too weak to kill a fully alert human. He reached into the dead human's bag, and by coincidence or some strange magical force, somehow managed to pull out a mojo paper. He grineed as he read it off. "An Ex Por." The human froze. Completely unable to move, he gurgled at Smo. "Get. . . you. . . orc. . . "
Smo began slowly piling wood from the campfire around the human. When he ran out, he took the lusk from one of the dead, and cut more. He added that to the pile. Finally, there was so much wood that the human couldn't move. How convenient for Smo. It was the human that cut him with the igg. "In Por Ylem," and a shimmering lig of magic cut into the human. Smo grinned as he screamed. "In Por Ylem, An Mani, Vas Flam." Slowly, the human's life faded away. Smo took an animalistic delight in his torture. Finally, with the lusk, he beheaded each of the three humans, and tossed the heads into the campfire. Though he was free, the elf was right - Smo was completely insane. "Rel Xen Ylem," Smo'dis mumbled. The dream had returned to him that night. "Rel Xen Ylem" was all he heard. And so, he cast it. He didn't know why, didn't understand that the spell he cast was the same one that a foolish old mage used ages ago to turn himself into a young orcish gruntee. He just knew he had to do it. He stood up, ate the last of the humans' food, and set out for the fort. He didn't know where he was going, he just felt drawn towards the area. He walked into the hut area, and was met by his friend Ur'ug. "Smo!" he exclaimed. "Wut habbund tu lat?" Smo'dis was startled. "Vas Flam," he mumbled, and shot a fireball at Ur'ug! "GAH!" Ur'ug screamed, and quickly subdued Smo with his kigg. He then dragged the unconscious orc into the Surjin hut, and called for the luskr Pigulg. Pig, using the lobotomy technique Smo had created, analyzed the crazy orc's brain. He shook his head. "Der nubting uz kan du fur im," he said. "Whi, wut am it?" Ur'ug asked. Pig looked at Ur'ug, then spoke one word.